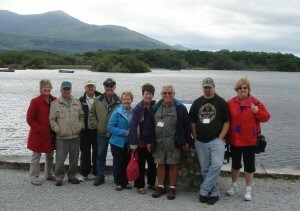 Monday, June 25 After registration, the Clan proceeded by bus to RossCastle on the KillarneyLakes area (photo below). Strange as it might seem, it was dry on our lake boat trip! 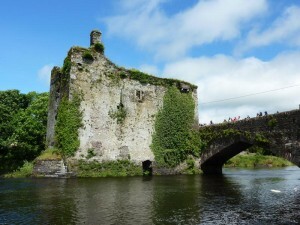 Then it was on to the market town of Macroom on the River Sullane. Entertainment was provided in the pub at the Castle Hotel that evening. 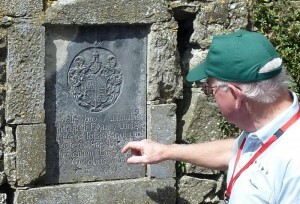 Tuesday, June 26 – The morning included a tour of the historic town of Macroom, starting at the plaque honoring Bishop MacEgan (see below), then continuing on to Macroom Castle which has been converted into a College named after Bishop MacEgan. 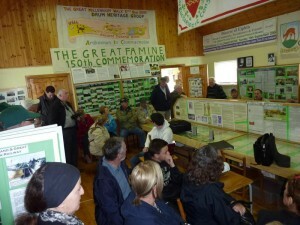 A local historian joined us there to give a talk on Egan influence in the area and other key events in local Irish history. The local historian then directed our bus on a visit to the actual historical sights, starting with CarrigadrohidCastle on a rock in the river Lee, now attached to a bridge. 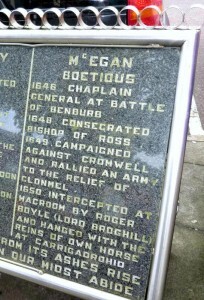 Bishop MacEgan was the leader of an Irish army holding the castle when the English army attacked in 1650. The Bishop was captured and offered his freedom if he would order the soldiers in the castle to surrender. When taken to the castle, however, he cried out “Hold out to the last for religion and country”, so the English hung him from a nearby tree by the reins of his own horse. 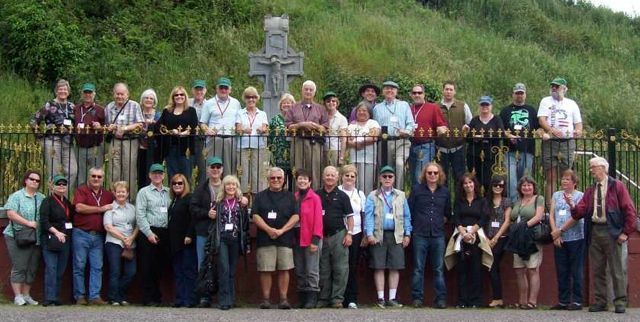 Our next stop was Beal na mBlath, a remote country road where MichaelCollins, a leader in the rebellion that resulted in Irish independence, was ambushed and killed, under suspicious circumstances according to our historian (see top photo of Clan at memorial). 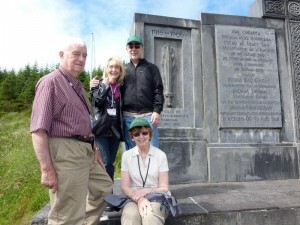 Nearby at Kilmichael was the memorial to another ambush, this one a rare Irish victory. Charges of a fake surrender taint this location, however, which turned into a massacre of the English troops. Feelings between the two sides were so bitter that many of the battles turned into massacres with no prisoners taken, unfortunate in the extreme violence from both sides. 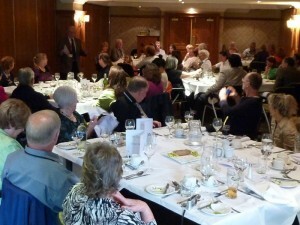 That night, the Clan had a custom dinner in a banquet room at the Castle Hotel. 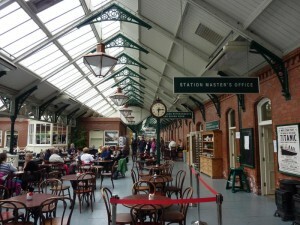 Wednesday, June 27 – We moved on to Cobh (pronounced “Cove”), a point of emigration for many Egans and the last stop of the Titanic 100 years ago when Cobh was called Queenstown after the visit of Queen Victoria. 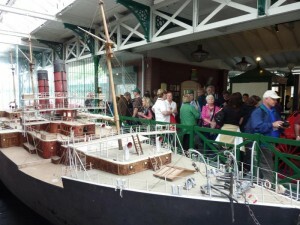 We first visited the Cobh Heritage Centre with exhibits on emigration and the great steamship era including the Titanic and Queen Mary. 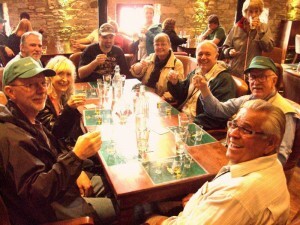 After lunch, the group went on to the Jameson Distillery. Michael’s connections as prior Chief Engineer and designer of the plant enabled us to take a special conducted tour of the facility as well as several members participating in a taste comparison of various whiskey formulas. It was a jolly ride back to Cobh for the evening. 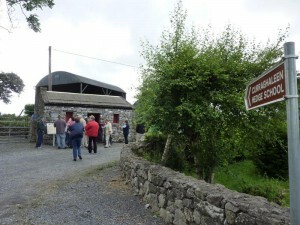 Thursday, June 28 – The day began with a stop at the ancient Rock of Cashel, reported to be the place where the King of Munster was converted to Christianity by St.Patrick, and a tour of the BruBoruCulturalCenter featuring Irish music next door where lunch was served with live music. At Lorrha, the cathedral ruins contain several markers with historical significance for the Egans, including the gravesite of a direct ancestor of some of the group on the bus and a stone for ConstantineEgan dating from 1689 which includes the Egan crest. From there, we visited the Redwood Mass Rock used for secluded outdoor Masses during penal times and the gate of RedwoodCastle, although the interior was not open. 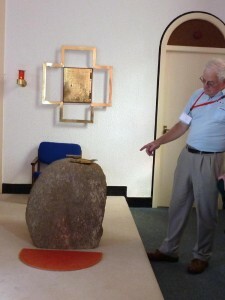 Friday, June 29 – The first stop today was at Fuerty Churchyard to see the gravestone of the Aidacain (Egan), the very first identified Egan who died in 865 AD (reddish stone in first photo). His headstone was uncovered in 1984, and research has identified him with the monastery at Clonmacnoise as a student and prominent churchman. 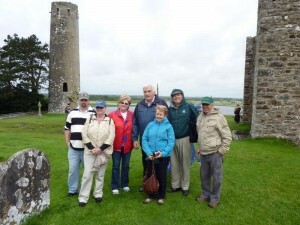 His education at Clonmacnoise was significant to the family as here the early Egans learned to be scribes, brehons and wise men and women. 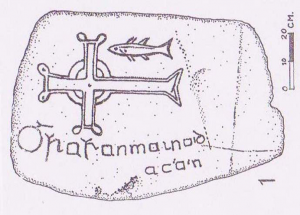 The detailed diagram of the stone that Michael provided in the last newsletter is shown again below. Next came the DrumHeritageCenter, open for only about a year. They were certainly glad to see us as we were the first large tour bus to visit them since they opened. 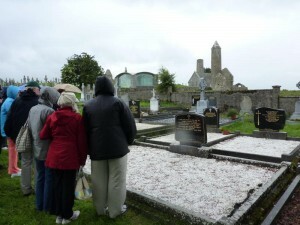 The center is next to a local churchyard and the shrine of St.Brigid’s Well. 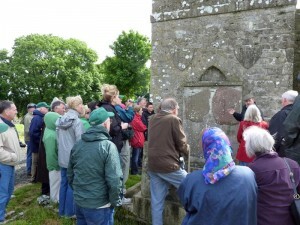 EdwardEgan, a local historian and author, gave a talk and directed a local tour visiting a Wake house (holding spot for bodies in medieval times) and a hedge school. 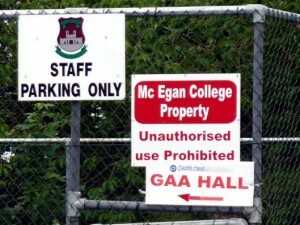 These schools were set up in secret by the Irish when the English forbade teaching the local children. 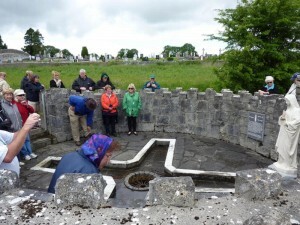 Saturday, June 30 – The morning began with a river cruise on the Shannon by Viking boat from Athlone to Clonmacnoise, a major medieval monastery and national historical shrine with special connections for MichaelJ.S.Egan’s family as multiple generations are buried there. 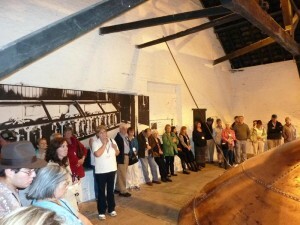 The site has an aura undimmed, perhaps even enhanced, by the light rain during our tour. 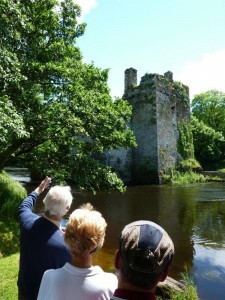 25 June leave Bunratty to travel through Killarney, visiting the Lakes of Killarney etc to Macroom, where a major battle took place in 987AD. 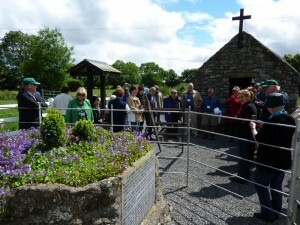 26 June visit Beal na mBalth, the location of Michael Collins’ death, Carrigadroihid to visit the Castle where Bishop Boetius MacEgan was executed in 1649 and Aghinagh, where we will drive the Aghinagh Way, an archaelogical drive organized by the Aghinagh Heritage Group. 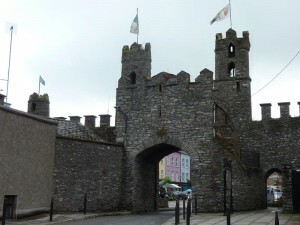 27 June leave Macroom and travel to Cobh, (formerly Queenstown) the departure point of many Irish families for the USA, where we will enjoy theQueenstown Story. 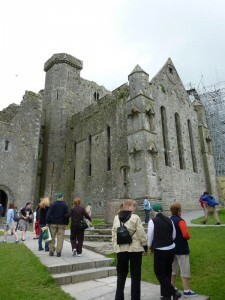 28 June leave Cobh and travel to Athlone via the Rock of Cashel. 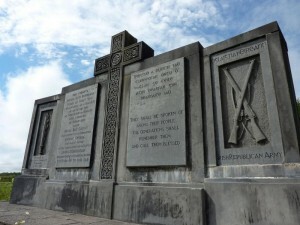 29 June visit the Athlone Castle and a historic centre nearby, and on to Fuerty, Co. Roscommon to visit the grave of the first known Egan – MacAodhagáin first informed us about this headstone at the Rally in Hobart in 2010. 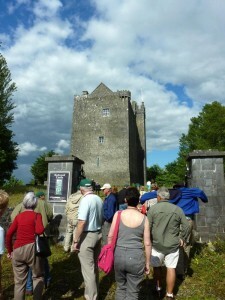 30 June return from Athlone to Bunratty via Loughrea, Redwood Castle and Nenagh and Lorrha which is at the centre of what was a major Egan seat and University. 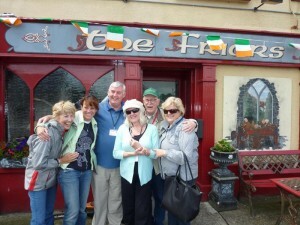 01 July a rest day in Bunratty to attend church services followed by the Banquet.